I've tested the steps on HP Cloud server. The quota option is not supported by kernel probably because of the virtualized environment. However, everything seems to be working. Thanks for this another "Perfect Howto". you need to install extra linux image package and use modprobe to enable quota modules on kernel. Finally you have a tutorial with Ubuntu AND Dovecot with ISP3. I've upgraded my Ubuntu 11.10 with courier to 12.04 and would change to dovecot. I know, that dovecot has another folder-structure as courier, but what steps a requered to change from courier to dovecot in Ubuntu 12.04? You will get a error that Maildir can not be moved into Maildir, thats ok and can be ignored. Any idea of the problem? Thanks in advance. The most important aspect of the project is SECURITY. A companion article on how to secure this configuration is essential. Hope someone will do it. So I followed the tutorial to the T, but I'm having a heck of a time getting the email tab to display. For example, if I were at the home tab and clicked over to email the email tab, it still says "Welcome Admin" and lists the available modules, but the side bar shows email accounts, mailing lists, etc. I tried clicking on each of the links in the side bar, but none of them do anything. All the other tabs display just fine. I figured out my issue. I setup an additional alias for squirrelmail as /mail, which conflicts with the ISPconfig file structure. Once I removed this alias, everything was happy. Excellent tutorial!! How do I remove the alias say I might have put it in? I am kind of a noob and have been reading tutorial after tutorial trying to fix my email, and I followed the directions to a T and have read the 300 page user manual for ISPConfig. You must live in Unimatrix Zero, because this is perfect. I got all the way to here in step 22 before I messed up and entered info instead of just hitting 'enter'. Excellent job! I enjoyed every bit of this tutorial! Did you get this corrected? I have the same issue. No errors in mail.log. It logs in but no mail. I see that there is mail in the Email -> Mailbox quota. Hello,thanks for this excellent tutorial. I follow all the steps of this tutorial. I create a dns zone and a site. But when i go to the new site in my browser, i always arrive on the squirrelmail login page. I don't know why??? I've the exact same problem. I followed all steps of this tutorial and everything went fine. All features will works just fine. My problem is that if I go to www.domain.com, it always points to squirrelmail login page, www.domain.com/src/login.php. 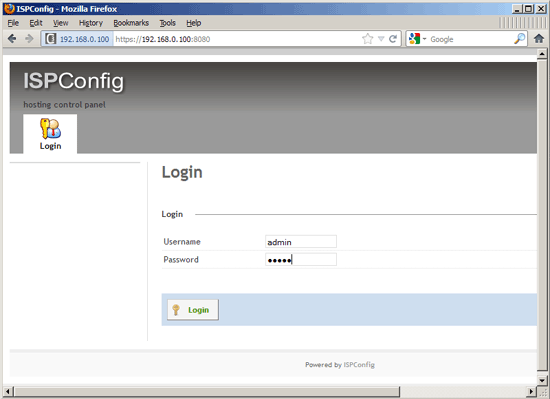 My idea is to use this perfect server as webhost, email server, ftp server and mysql server. I want use my registrant DNS server as a nameservers. I can change all DNS records via my domain registrant. I want to host my domain.com on my perfect server. The perfect server hostname is the same linux.domain.com, whether this matter ??? Should I book and reserve "unique" domainperfserver.com and use that domain as servername and not the same domain.com I want to host (website). i found this article looking for a guide to install ispconfig, and i find myself scouring through 5 of 6 pages looking for what parts of this guide are important to ispconfig, instead of following a 1 or 2 page guide. much of the first 5 pages are not necessary for ispconfig, but without figuring out what is and what isnt, i get install errors. my suggestion would be tier'd style, walking through the install of the primary topic, and inserting optional addons as side notes. if i'm thinking this, others must be as well, and it would really help out us noobs. I have tried to check all the log files etc but I cant find anything that gives more info on it. just to get it to start sending mail without SSL. I have followed the howto step by step a few times now, re-installed the server twice and also removed and re-installed all packages related to the install, im going a bit insane trying to fix it!! Can anyone give me some direction on what I should be looking for? After installation whenever i tried to access ispconfig with ip:8080 it shows error and tell me to access by https wich is normal as i followed that tutorial and did what they said there . But after restarting when i try to access ispconfig with https://ip:8080 it just loading and loading , nothing was and is showing . When i try to http://ip:8080 , it shows Bad Request Your browser sent a request that this server could not understand. Reason: You're speaking plain HTTP to an SSL-enabled server port. Instead use the HTTPS scheme to access this URL, please. Hint: https://server1.domain.com:8080/ But my domain is not yet managed as it takes time(is that?) . I have registered nameserver from my registerer ns1 and ns2 by that ip and changed the nameserver . But as it is yet not live , how can i access ispconfig with that ip as i did before , before restart ? Thank you very much for a "very! 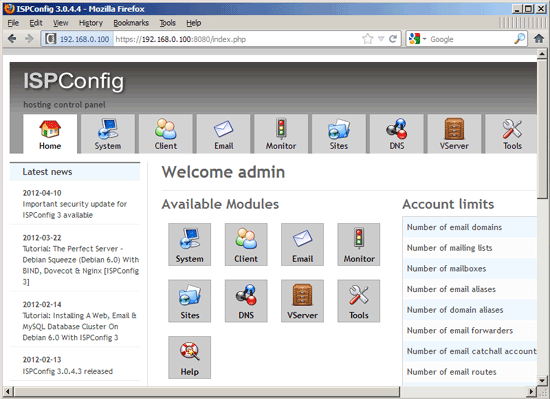 step-by-step" web server setup. I think I have been resistant to ubuntu simply because of the name. Lord only know, SuSE and OpenSuSE were bad enough -- Slackware? Debian? --- but "oo boon too"? That was just too much! Or so I thought! After all, there are so many distros to choose from. I've used SuSE for years to host a mail service using Exim and have had no problems with SuSE 8.0 and Exim 4 has been a joy! I never liked the GUIs, so the text interface was just right for me. With most of the new distros, you have to "intervene" to get to text. So, I've been using OpenSuSE 11.4 with Ctrl-Alt F2 for a good while. But, 11.4 is no longer "supported" as it seems. So, here I am with a project! I need to set up a website for my daughter and son-in-law and I'd like to host it here under my thumb, as it were. Where to begin; where to begin? I began reading your "The Perfect Server" (ignoring the word "Ubuntu" because I could pick my own distro, couldn't I!). It didn't take but a paragraph of two for me to realize that Ubuntu was just what I needed to use. I got the 32 and 64-bit versions because I wasn't sure what piece of crap I was going to use for my server. In the end, I decided to use an old Dell Optiplex GX-270 Small Form Factor with a lowly Celeron processor and only 1 GB of RAM. Just the on-board VGA, but wait . . . . I'll be using text! OK! Let's get going. Installation was a breeze and once I got the SSH host installed, I switched to my big machine and used PuTTY 0.62 and the rest was a breeze. I'm sure everybody in the world already know this, but you never can tell. If one highlights text in a GUI like Windows and toggles to his SSH client page, a click of the right mouse button will paste the Windows "scratchpad" at the cursor in the ssh "window" and all that's left is to touch "Enter." were accomplished by highlighting those lines, opening the file with the editor (I like "joe" best), positioning the cursor just below the line " <IfModule mod_php5.c>" and giving a single click of the right button. No more misspelled commands! During installs, I toggled to a solitaire window where I could see the left edge of the PuTTY screen and when I saw the # prompt reappear, I'd go to the next step. When I used a Windows machine to resolve the url "192.168.40.100" and saw the message "It Works!" --- well, I'm taking a short break to say "Thanks!" before I work on content and then get my DNS info pointing to my server. Wow! This tutorial was not at all awesome, but way way beyond awesome. Thank you very much for your help. It saves me a lot time for installing ISPConfig 3.0.